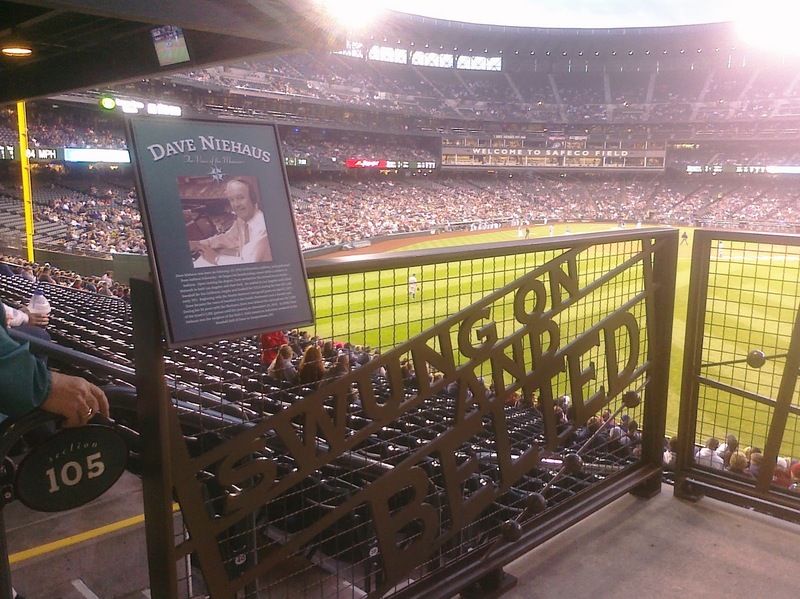 The spirit of Dave lives on at Safeco Field … forever. The statue is remarkably lifelike down to the smallest detail. Niehaus is wearing one of his favorite neckties with tiny baseballs on it (picked out for this purpose by Dave’s wife Marilyn and their daughter Greta), and were it not for the fact that it is made of bronze, Dave’s sport coat would likely be one of his trademark pastels. The scorebook in front of him is open to the American League Division Series game against the New York Yankees on October 8, 1995 – a game that was won by Edgar Martinez’s double down the left field line that is immortalized in Dave’s legendary call. The pages are engraved with Dave’s actual notes and scoring of the game. 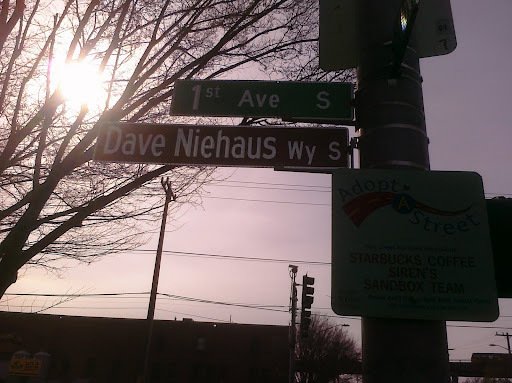 The artist, Lou Cella, worked from dozens of photos to capture the essence of Niehaus. 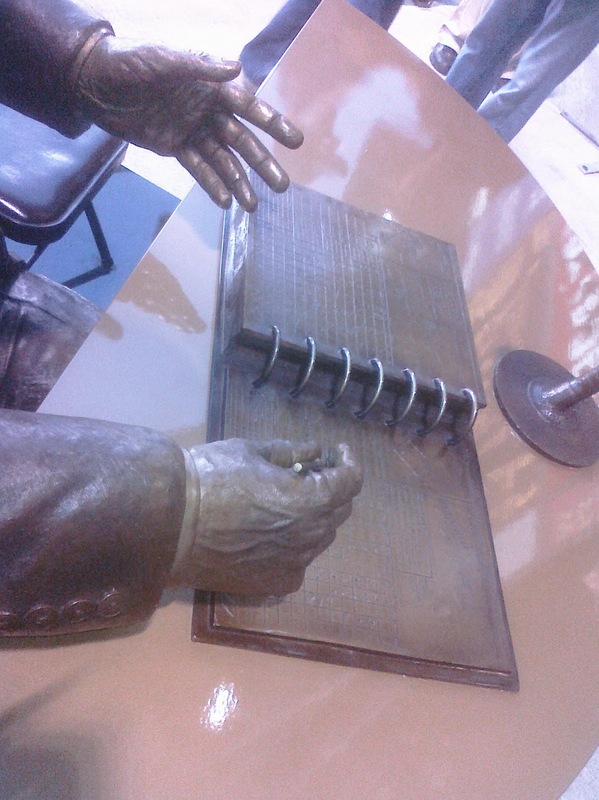 The piece was first sculpted in clay and then cast in bronze. It started out so well. All of the events and ceremony leading up to the game seemed destined to leave an indelible mark upon the collective Mariner memory. 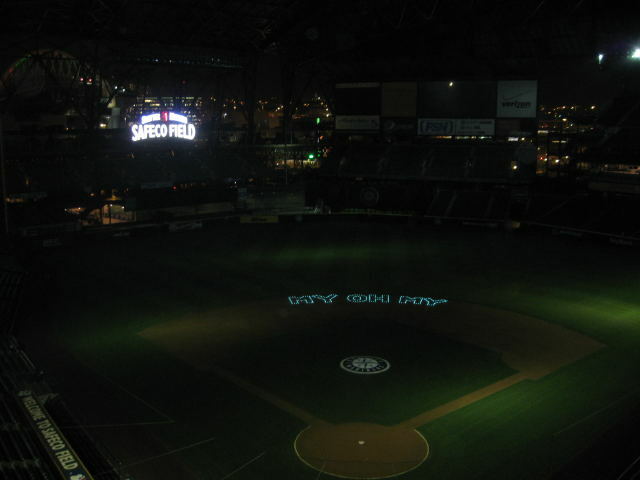 It was a little odd, being the first Mariner Opening Day held at night since 2001 (which I chose to take as a good omen, little did I know that the bad omen would over-shadow the good when my phone battery died prior to the 4th inning). I didn’t abide with my tradition of taking the day off and spending the morning at a spa. Instead, I went to work a couple hours earlier than usual so I could leave in time to get to the corner of Royal Brougham and the “new street” to be witness to the unveiling ceremony. I arrived just as just as the crew was finishing the audio setup. A huge crowd was gathered at “The Glove” awaiting the final unveiling (the veil was a sign in itself that read “My Oh My!”). I was tapped on the shoulder by Chuck Armstrong as he parted the crowd, clearing the way for the entire Niehaus family. Several city and county politicians took turns reading portions of the proclamation and giving credit to the citizens who started the grassroots campaign. And then…. I had a couple of hours before my “date” would arrive (my mom-in-law was planning to meet me at 6:15pm) so I decided to meander through the Team Store and, of course, couldn’t escape without purchasing a couple of items. Then, my stomach was talking to me, so decided I’d head up to the 300 level where I knew I could get a gyro. I enjoyed said gyro from my regular seat (had to buy other tix for the evening, since I only have one season seat these days) while watching the Indians take batting practice and listening to the pre-game show … a lot of talk about the Jack Wilson controversy – more on that later. Then, got a call from my mom-in-law – she was here! So went down to meet her so we could make our way to our seats for the evening (section 306 – right center field) and we were good and settled in with plenty of time to spare before the festivities. 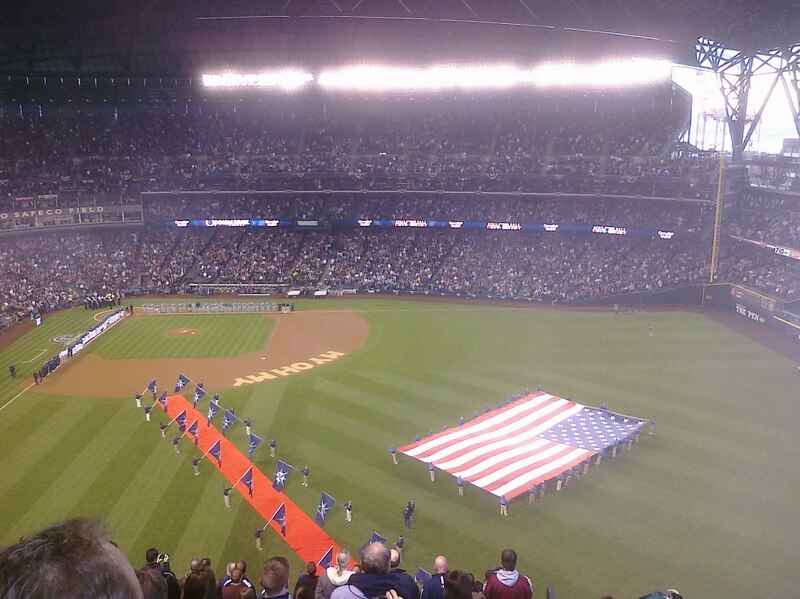 It started, as every home opener since 1999 (when Safeco Field opened) with a Make-A-Wish kid being the first to “touch ’em all!”. Eleven year-old Kamrin Cramer soaked up every minute of his trot around the bases, stopping at each one to wave to the crowd. Then it was time for the introductions – the visiting Tribe first, of course. Then the red carpet was rolled out and the 2011 Mariners ran in one-by-one from the centerfield gate to the first base line as they were introduced. Felix, of course, received the loudest ovation, followed closely by Ichiro and Michael Pineada (yay!). A huge flag was carried onto the field and the Navy Band Northwest performed the National Anthem. Next, the awards for the 2010 season were presented. Guti (who is still rehabbing in Arizona) and Ichiro received their Gold Gloves and Felix his Cy Young (what a birthday gift – Happy 25th, Felix!). Then, a little extra something – Edgar was there to present a framed photo commemorating the new Mariner hit-king (Ichiro surpassed Gar in that category during the second game of the season). They embraced and exchanged words (would have loved to hear that conversation!). It was a very nice moment. Then came the tough but touching part. Macklemore and Ryan Lewis performed the fabulous “My Oh My” song. Even those who are not rap fans (like me) had to be moved to tears by his sincere emotion. Add to that the video highlights and Dave’s calls interspersed, it was a quite perfect tribute. Marilyn Niehaus made her way out to the mound and threw a strike to Felix with her entire family standing behind her. Another “what a moment” moment. Then, all the Niehaus grandchildren signaled the start of the game with a hearty “PLAY BALL!” It was 7:20pm and 53 degrees. Okay – that’s about all I have for you. From that point on, it’s a bit of a blur. Seems my cell phone battery wasn’t the only thing that died and I’m relatively sure that the real Jason Vargas was abducted by aliens – or at least the ghost of Chief Wahoo found a way to extract Jason’s command. I mean, we are used to offensive woes … we are not used to the pitching being offensive. It’s a shame that the fabulous pomp had to be over-shadowed by the disastrous circumstance but, I’ve no doubt that, from above, Dave was singing the Wabash Cannonball. 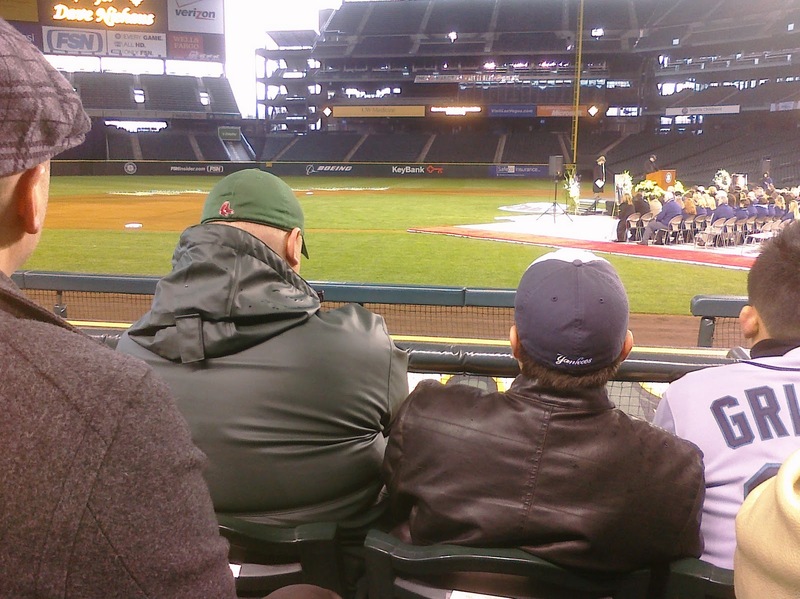 And, that he truly appreciated the love and respect that over-flowed from Safeco Field last night. How are we going to do this without him? 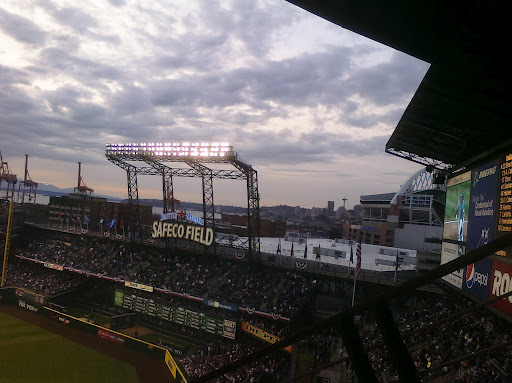 Yes, it’s 2011, not 2008, but the great thing about baseball is that we welcome it back EVERY year. Hearing Dave’s voice on this video is bittersweet. It’s both comforting and heartbreaking at the same time. I have wondered since the day that he died last November, how will we carry on in our baseball lives without him … but we must and we will. He wouldn’t want it any other way. baseball … on the radio … tomorrow! but it’s a real, live baseball game we can actually listen to! 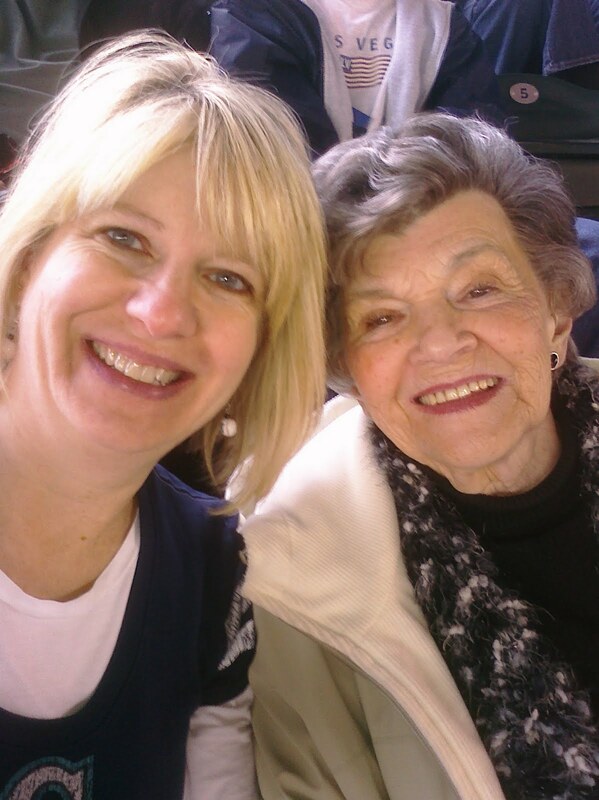 Marilyn Niehaus says her husband Dave was a huge Seahawks fan who never missed a game. And, yes, the Mariners’ Hall of Fame broadcaster would have been beaming with pride on Friday, knowing his wife was atop the Space Needle raising the 12th Man flag in anticipation of Sunday’s NFL playoff game against the Chicago Bears. “I feel like I’m still flying high,” Marilyn said several hours after coming down from the top of Seattle’s most famous landmark. “That was an incredible experience. I will never look at the Space Needle the same way again.” The Seahawks approached the Niehaus family earlier this week about raising the flag. And despite the expected trepidation of standing astride the 605-foot-high structure on a wet and windy Northwest morning, this one wasn’t a subject for family debate. “I didn’t hesitate,” Marilyn said. “They did ask if I have a fear of heights, which I do a little bit. But I didn’t want to tell them.” So that was that. 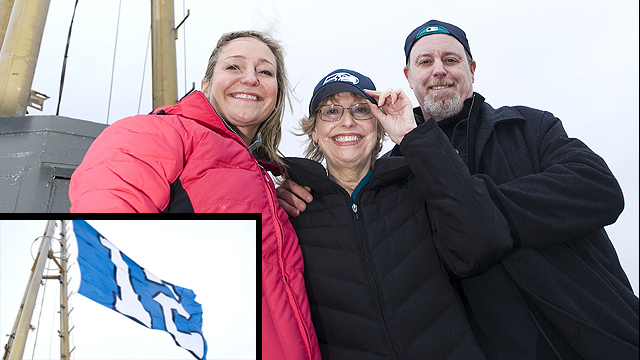 Marilyn and two of her children, Greta Niehaus Dunn and Andy Niehaus, found themselves climbing two steep flights of stairs and then about a 20-foot ladder to the top of the Needle, where they then raised the flag. I am an echo in home run calls. I am the flash of white on a well struck ball. I am the sunlight on the outfield grass. I am the powerful autumn home run blast. I am there, yes you know me. Swung on and belted; I am the tears on your cheek. I am high above looking down. He started to breakdown but, was able to regain his composure with “a little help from his friends” (Jay, Danny, Red and Gar stepped up on stage to show their support) and then proclaim, “Tom Hanks was wrong.” (eluding to the fact that there IS crying in baseball). Ron, Dan, Jay and Edgar each shared their favorite funny stories and fond memories of Dave. Both gave heartfelt tributes with glowing examples of how their father was just as kind and giving in his family life as in his professional life – as fabulous a husband, father and grandfather as he was a broadcaster and baseball fan. He lived life to the fullest and enjoyed every moment spent with his family and on his job. referring to the fact that he didn’t think of his job as work, but truly felt it as a passion. He shared that passion to with all who would listen. Marlaina Lieberg, a representative for the Washington Council of the Blind also spoke, describing how Dave was able to bring the sights, sounds, smells and feelings of the game of baseball to the blind. Apparently, respect and admiration for Dave knows no bounds of fandom. These two were seated together for the entire ceremony. You would have been so proud of your family and the grace with which they expressed their sorrow and love. You would have been touched with the gamut of emotions that the stories the speakers shared invoked (we needed to cry, but you would want us to laugh – we did both). You would have been pleased with the ways in which your employer chose to remember and revere you. 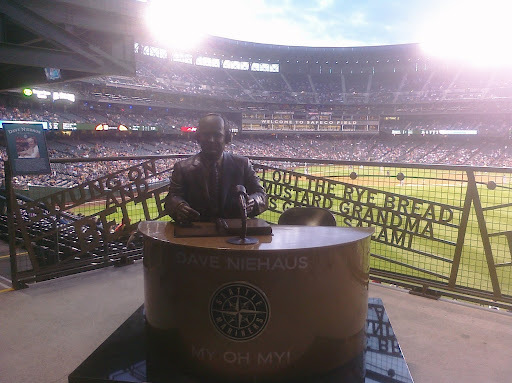 We are eager to see the statue that will be erected in your honor, but we are dreading the emptiness we will feel the first time we listen to a Mariners game without hearing your voice.